Yes, these are all good options. Look through books and websites of roof options and you’ll see lots of possibilities. 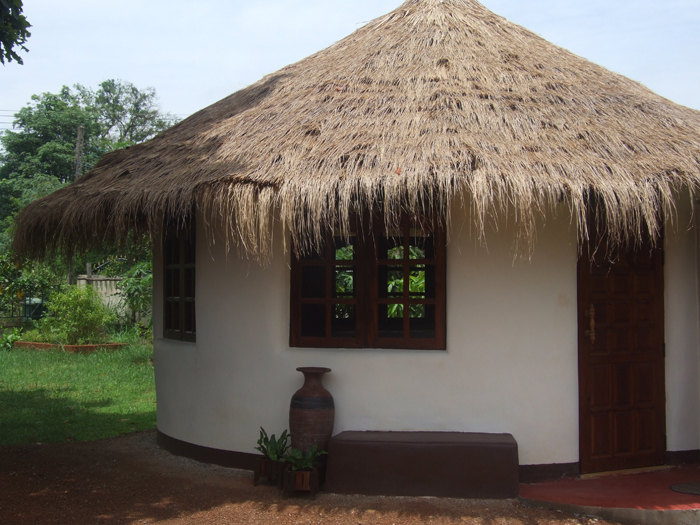 For example, I’m designing one now with a flat roof and a thatched roof over that to provide a covered deck. Many of my clients want something unique and so they’re making changes like this. Yes, it will work in code areas if you use a concrete foundation and bond beam, and standardized roof framing or factory trusses . If there are no or few codes, the plan will work as is. I really appreciate the video you have of this house. After viewing it a few times, I think I will start with it to live in while building the others, instead of the hobbit house, and keep it as a guest house. No kitchen, but I could BBQ or use a hot plate, and use an ice chest or mini frig. But it is much larger than I thought! Would it hold a queen size bed if you didn’t need the table and chair in there? 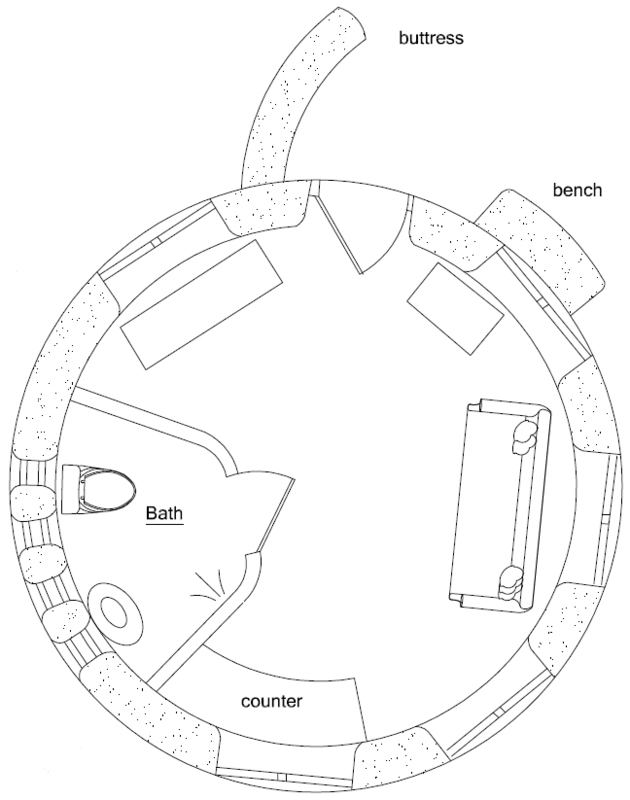 And I like the deck idea on the 33′ roundhouse – if I felt adventurous, might do that on this one! This is a very practical design. We could have built almost anything, but decided on this design for our own use after a lot of thought. There is a countertop on the back wall. You could enlarge this area a bit for cooking. We allowed just enough space for a hot plate, coffee pot and making a sandwich. A mini frig fits below the counter. Install electrical outlets above and below the counter. You could even add a bar sink if you wanted. Research kitchens in tiny homes. There are lots of space saving ideas. A queen size bed will stick way out into the room due to the curved walls. You can see this yourself by drawing a circle on graph paper and then adding furniture. It’s best for a futon couch/fold-out bed. Add 2′-3′ extra diameter if you want a queen size bed. You might want to add a sleeping loft so it doesn’t take up so much space. That’s probably the best option if you plan to live there a while. Then you will have much more living space for other activities. If you you think you may end up living there a long time, go ahead and build the roundhouse about 2′-3′ larger in diameter so you won’t feel cramped. The extra cost will be negligible. The loft is a great idea. I don’t know why I didn’t think about that – for the last few years I’ve been looking at van campers to live in while I’m working, and I finally realized that the only way I’m going to get one that has a full bathroom, enough storage space, AND a dedicated bed is to get one with a bed over the cab – the loft bed is pretty much the same concept. I guess I am looking at this house in the same terms – temporary housing in between work assignments while I am building the rest of the “compound.” 🙂 I just want something a little bigger than a van, and I don’t want to have to fold up a bed every day, and I want it to be comfortable. It doesn’t actually have to be a queen – I was just thinking in terms of what I already have. Northeast Texas may not quite be tropical, but the large arched openings and open deck sound great! You could add doors and screen doors to the arched openings for climates like Texas. Plus, on this new plan I would add a window over the sink and desk. This is just one example. Every design shown here can be tweaked for your climate. I am in South west of Western Australia and am interested in more info on your Round House studio. How do I go about purchasing plans? Also interested in alternative roof materials – although will probably have to settle for corrigated iron. You can email me at natural houses [at] g mail [dot] com for details. Metal roofing is fast, affordable, convenient and makes it easy to capture roofwater. You might want to add roof insulation. Check with local builders to see what they use. Hello Owen, I just purchased your book Earthbag Building Guide! I bought some land in Maui and would like to build a small structure to use as storage and ultimately a guest studio. I have to build any main structure at least 12″ above sea level due to tsunami’s. The land is by the ocean. So, I’m not sure the earthbags would be the best choice for the main structure and was thinking of a pole home for that. However, I can build maximum of 100 square foot structure without permits and was thinking a studio/storage area with outside covered shower area. I like the round houses and read the article in Mother Earth News with the details of the minibuilding. However, I think you were suggesting a metal roof for rainy hot climates? Can you suggest any plans I could buy which would give be about 100 square feet round with metal roof and an attached covered outdoor shower area? You really don’t need plans for something so small and simple. Keep learning about what’s available and soon you’ll know what to do. Here are just a few options. Also, there are other 2nd story open-air deck plans. Just search the site. Thanks Owen for the answer! Just to be on the safe side, I read somewhere that you don’t custom anymore plans. Is it still true? That’s right. I’m getting too busy, plus it’s best to have a local designer adjust the plans to your climate, building site, etc.